If you have ever watched a film where there are people on quad bikes, racing across the flat or storming their way through sand dunes, it is bound to be something you want to try. In Riga there is the opportunity to race against your friends and feel the wind blowing through your hair – or at least past your helmet. You will be fully protected with the equipment provided and if you have not ridden before plenty of advice will be given. The 20 minutes you spend on the Honda and Yamaha bikes will stay with you, and while you are enjoying the experience, don’t forget you are being timed. There will be a winner in this event and you will want it to be you. You could have a little wager on it before you start, but that will not add anything to the excitement. The track is new so in excellent condition and you will be riding through the fields and forests for around about 3 miles. Don’t forget you are doing this against the clock. Once you have finished there will be a beer before you and you excited friends are transported back to your hotel. A Quad bike a vehicle with four wheels and a mass of less than 550 kg. 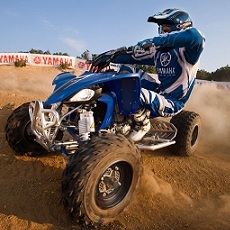 To drive a quad bike on a public road, requires a B1 license as well as tax, insurance and registration. 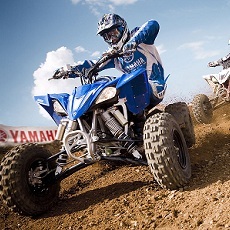 Safety has been a major issue with quad-bikes due to the high number of deaths and injuries associated with them and the negligible protection offered by the machine. Six is a minimum number of people required and we can also cater for large groups. Standard sessions last 20 minutes. Longer sessions are available on request, depending on abilities and experience.